Use the right needle! Place the eye of the needle, half ribbon and half needle between your thumb and first finger. Rub your finger and thumb together. You should “feel” the same amount of ribbon as needle. If the ribbon feels thicker – get a bigger needle. 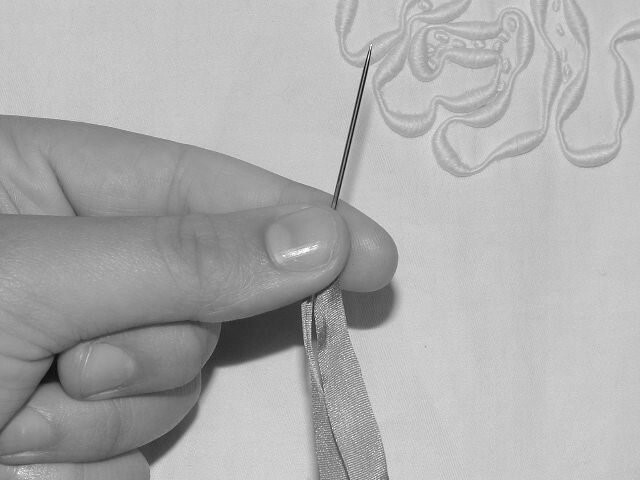 Using a needle that is too small will cause the ribbon to fray, and may even break the needle. It is also hard on your fingers! 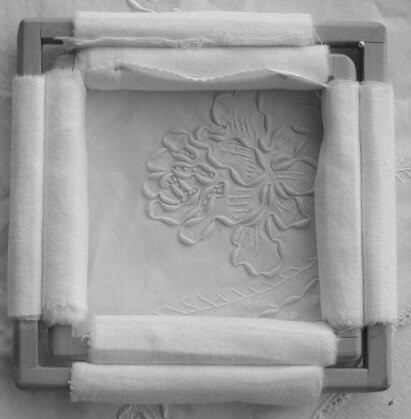 When I am doing the ribbon embroidery – generally I do not use a frame. When I do need a frame, for any handwork, I always use a square frame. The square frame will give you the largest amount of embroidery or quilting space without pulling your foundation fabric on the bias. You want to make sure the warp and the weft threads are straight and perpendicular to each other. This will help your piece to stay nice and flat. The picture is of my vintage square Japanese frame. The tension is adjusted by adding extra wraps of the flannel or by removing them. Thimbles – I have always had a hard time finding the right thimble. Several years ago I found a thimble with the top cut out at an antique store. It was very large and fit my thumb perfectly. When I quilt I push the needle with my thumb so this was a great find. Later I learned that this style is a Tailor’s thimble. For appliqué, I use a leather thimble pad on my middle right finger and push the needle with my middle finger and thumb. 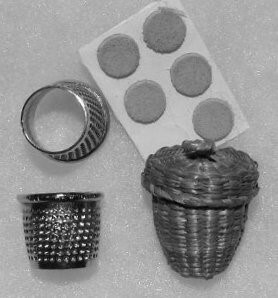 Years ago I received a lovely woven thimble holder – it always brings me fond memories of Aunt Jan. Step One ~ Thread the needle and place the needle 2 to 3 inches down the ribbon. Pierce the needle through the ribbon at the shortest end of the ribbon. Step Two ~ Pull the silk ribbon until the needle is at the end. This will leave a small loop at the needle end. This will protect your silk from needle fraying and maximize the ribbon you can use. Step Three ~ Knot the ribbon by taking a small stitch at the “other” end of the ribbon. Start by placing the needle at the end of the ribbon, with the needle making a complete circle. Make a running stitch and pull the needle through. 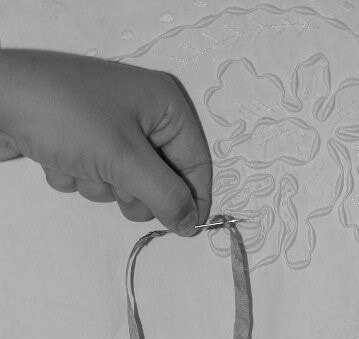 The stitch will make enough of a “knot” to secure the ribbon in place.